I trust you are well. Wanted to be in touch to see how you are these days? I imagine you have been busy with a multitude of interesting activities. We’ve been busy here in Connecticut. Just fired the Pyranhagama this past week and it seems to have gone well. Fired it a bit differently this time…to a lower temp…cone 13’s tip just touched down by the end. Top temp was 1294 C. Once we hit that…loaded green wood in and dropped the temp 16 degrees then climbed back up….continued the cycle for a while then opened up passive dampers on flue and cut down air in front….temp dropped again and then worked the kiln up slowly with thin split dry wood for about 4 hours….the flame and heat stayed contained in the kiln’s chamber. Finished by stuffing the firebox with green pine and closed off all openings in the chamber including the active damper doors to flue. I pulled out a jug yesterday and think the firing may be good…the jug is covered in ash glaze rivulets and from what I can see….the other pots look nice. Can’t wait to unload on Wednesday! I’ll send some pics of the pieces as soon as they are photographed. Am wondering what kind of changes will be in order for the next firing….plus happy to be making good steps forward. I trust you are well and keeping busy here in early 2012. I have a feeling this is going to be another great year for you! I’ll bet you are planning on getting your new kiln fired too. Wanted to send you a few shots of the pots from the firing…the unload was good…best overall success rate ever for me personally. Here’s a link to the unloading afternoon… https://plus.google.com/u/0/photos/112982358046210156183/albums/5693986207625107649 . 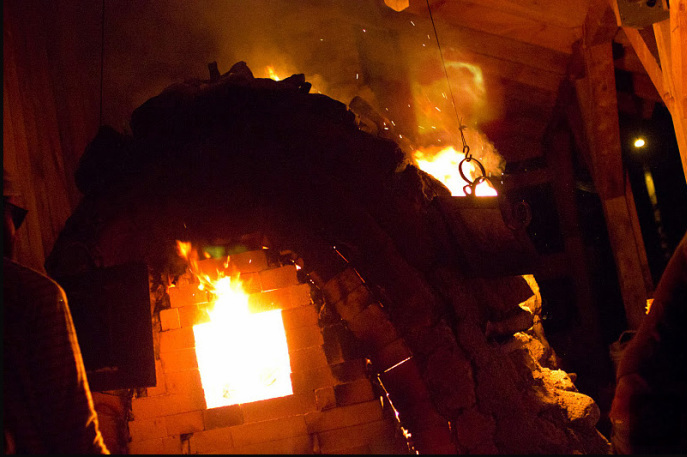 This entry was posted in anagamania and tagged anagama, wood-firing. Bookmark the permalink.